Rectory built by Rev. H.D.E. Bull, who lived in it with his family of 14 children. Legend (later disproved) that Rectory had been built on the site of an old monastery, with nunnery nearby at Bures. P. Shaw Jeffery stayed at the Rectory as an undergraduate during vacations. Reported (much later) that stone-throwing and other poltergeist phenomena had occurred during his visits. Four sisters - the Misses Bull - claim to have seen apparition of a nun on the Rectory lawn. Other phenomena reported by them. Harry Price joins the S.P.R. and remains a member until his death. Price founds his own organisation for psychical investigation. Death of Harry F. Bull. Difficulty in finding a successor. Rectory stands empty for several months. Rev. G. Eric Smith appointed to the living. Mr Smith writes to the Daily Mirror alleging paranormal occurrences at Rectory. Daily Mirror sends down reporter, V.C. Wall, and contacts Price. Borley phenomena first reported in the Press. Price visits Borley accompanied by secretary, Miss Kaye. Takes statements from various people including the Misses Bull. Price and party visit the Rectory. Various phenomena reported. and Miss Kaye. Various phenomena reported. The Smiths move out of the Rectory and reside at Long Melford. Probable date of visit to Rectory by Charles Sutton of the Daily Mail. Lord Charles Hope and party visit Rectory. Miss Kaye present. Price absent through illness. Price busy with Rudi Schneider experiments. Three sittings a week. Price writes book on Rudi Schneider which is in print by the end of 1930. The Smiths leave Borley and move to Norfolk. Price in Borley district collecting information. Interviews Fred Cartwright at Sudbury. Rev. L.A. Foyster (cousin to Rev. Harry F. Bull) having been appointed to the living takes up residence at the Rectory with his very much younger wife, Marianne, and an adopted daughter, Adelaide, aged 2½ years. Foyster makes a written record of a variety of phenomena at the Rectory commencing soon after arrival. Neighbours at Borley become interested in the phenomena viz: (1) Sir George and Lady Whitehouse with their nephew Edwin, later Dom Richard Whitehouse; (2) Sir John and Lady Braithwaite. Sir John expresses the view that Mrs Foyster is 'psychic and hysterical'. Foyster argues against the view that it is all hysteria, quoting cases of stone-throwing for which Mrs Foyster could not have been responsible. The Misses Bull call on Price in London and urge him to visit Borley again. Foyster invites Price, who accepts. Mr W.H. Salter, having heard of Price's impending visit, goes to Borley himself and advises Foyster, if Price's visit cannot be averted, to get him to sign a statement against any form of publicity. Offers the services of the S.P.R. if they should be needed. Price visits the Rectory with a party which includes Mrs Goldney. They see 'wine turned into ink' which Price thinks is a trick and tells Foyster so. They part on bad terms. Edwin Whitehouse (later to become Dom Richard Whitehouse) visits the Smiths at their new address in Norfolk. In a letter to Mr Smith, Price says that he would like to go to Borley again but that the Foysters will not permit it. Price believed to have visited the Rectory. Reason for visit unknown. Mrs Foyster goes to work in London as part proprietor of a flower shop, but returns to Borley at week ends. In a letter to Everard Feilding, Price repeats his view that on the last occasion he visited Borley the Rector's wife was 'just fooling us', but adds 'I certainly want to go down again and am waiting for Mr Foyster to move out of the place. Five years ago the place was literally alive with - something. It drove the Rectory (a Mr Smith) out of the place. The Foysters leave Borley. Rectory again unoccupied. Price's book, Confessions of a Ghost Hunter, is published. Contains veiled references to Borley which show that Price thought the events he had observed there in 1931 were not paranormal, but he re-affirms that he thinks the events that had occurred on his earlier visits were paranormal. Rev. A.C. Henning becomes Rector, but does not reside in the Rectory. Price rents the Rectory for one year. Advertises in The Times for volunteers to join a rota of investigators. 48 names accepted. Compiles a book of instructions for the observers known as 'The Blue Book'. Borley. Made enquiries on his own initiative. Interviewed neighbours, including the Whitehouses. Visited the Smiths, then living in Kent. Contacted the Foysters then living in Ipswich. Also collected local gossip. Records preserved in a locked book. Glanville's daughter experiments with planchette. Receives messages which seen to confirm the Borley legend. At a planchette séance with Miss Glanville, a comminicator threatens to burn down the Rectory. Rectory purchased by Capt. Gregson, presumably with the intention of commercializing it. Borley Rectory is destroyed by fire. Glanville arranges meetings between Price and the Whitehouses. On hearing their testimony, Price's views of Mrs Foyster undergo a change. Through the good offices Glanville, good relations are restored between Price and the Foysters. Foyster gives permission for his records to be quoted in MHH. A Cambridge Commission under Dr A.J.B. Robertson pays numerous visits to the burnt-out Rectory and submits a report to Price which is later published in EBR. Death of Rev. G.E. Smith. Price's first book on Borley, The Most Haunted House in England, is published. Among other appreciative letters, Price receives two from Mrs G.E. Smith who congratulates him on having written a 'wonderful book'. W.J. Phythian Adams, Canon of Carlisle, sends Price an ingenious analysis of the occurrences in relation to the legend and planchette writing. witnesses not coming up to their proofs, Jelf writes that 'a very strong case has undoubtedly been put forward, and we are at a loss to know what cross-examination could possibly shake it'. Visits of Polish Officers to Borley. Price excavates the wells and cellars at the Rectory. Human bones and other objects found. Ruins of the Rectory finally demolished. Price, accompanied by reporter and photographer from the American Magazine Time-Life, visits the Rectory whilst demolition work is in progress. Controversial photograph taken of 'flying brick'. Mrs G.E. Smith writes to the Church Times saying that neither she nor her late husband had believed the Rectory to be haunted. Price confers with Glanville and Henning and decides to ignore her letter. Price publishes Poltergeist Over England - an anthology of cases, ancient and modern, in which the principle of selection is rather that of excluding fraudulent cases than that of including only such cases as might, more or less, be guaranteed genuine. This method of selection resulted in a wider variety of cases than had ever been gathered together in one volume before, and enabled the presence of similar features to be seen and compared in many different cases. 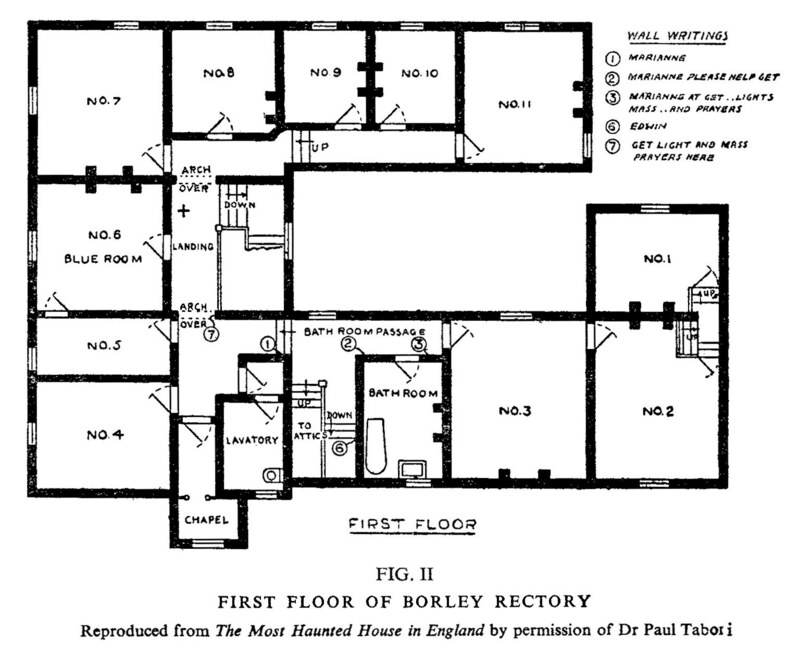 Poltergeist Over England contains a chapter on Borley. Price's second Borley book, The End of Borley Rectory, is published. At the time of his death Price had begun a third book on Borley. Mrs G.E. Smith writes to the Daily Mail and again asserts her disbelief in the Borley haunting. the occasion of a joint visit to Borley in 1929. Death of S.H. Glanville. Projected symposium on Borley abandoned. 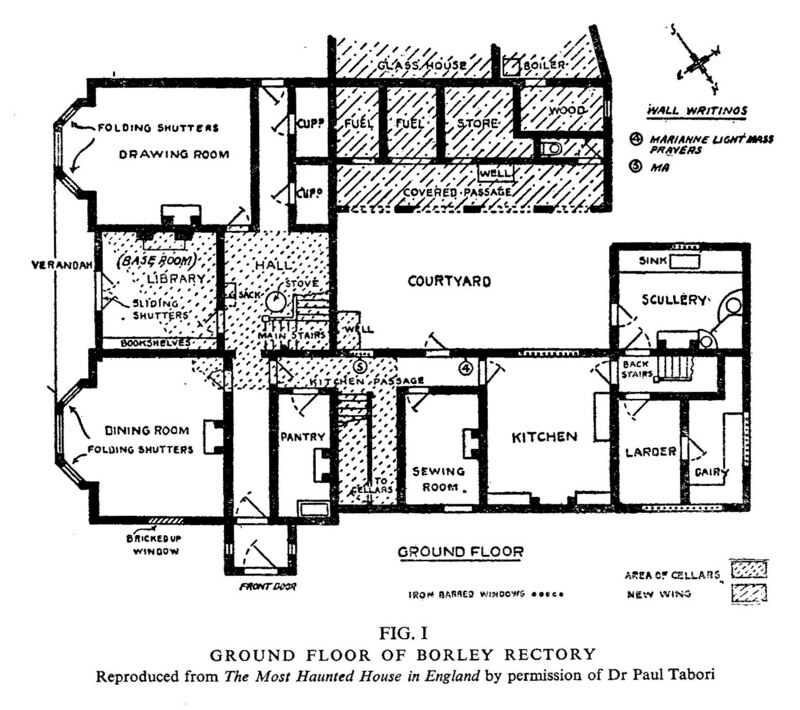 The Haunting of Borley Rectory - A Critical Survey of the Evidence by E.J. Dingwall, K.M. Goldney, and T.H. Hall, is published simultaneously by Duckworth and Co. and in Proceedings, S.P.R. The Research Advirsory Committee of the S.P.R. authorize re-examination of the Borley files and make a grant in aid of expenses.